Prohibition was an era in American history in which alcohol was made illegal, but many Americans drank it anyway! This thirst for grandpa's old cough syrup was so ingrained in western culture that making booze illegal was destined for failure, and so began bootlegging and the production of moonshine that made people blind, ill or die. The demand of alcohol was that great! However, there were a few sources of good quality alcohol. To the north, from Canada, came the prized whiskey you might know as Canadian Club. From Scotland came Cutty Sark, which was smuggled into the United States in the 1920's by Captain William S McCoy. Cutty Sark salutes Captain Bill McCoy with this Prohibition Edition, and remembers a man who was so influential to its whisky image that Cutty Sark became known among many as "the real McCoy". Cutty Sark describe the Prohibition Edition as "full flavoured and challenging... [with] rich, rugged and authentic full flavour". This is absolutely spot on, and it shows that this whisky has been produced with a particular palate and flavour profile in mind. Not everyone in my view will love this whisky at first taste, but most whisky lover's should appreciate that this beauty is a masterful piece of blending that pays tribute to a man who helped quench the American thirst for booze during Prohibition - Captain Bill McCoy. The Cutty Sark Prohibition Edition is an intensely flavoured whisky with a thuggish attitude but smooth touch, unleashing a heavy handed character that electrifies that taste buds with malt, spice (pepper especially), toffee, burnt orange, caramelized sugars and layers of fruit and oak influence. This whisky offers a solid punch of flavour and an entertaining display that ducks and weaves without warning - float like a butterfly, sting like a bee! The Cutty Sark Prohibition may not be to everybody's taste, but for the experienced whisky taster it is quite an experience that I highly recommend. 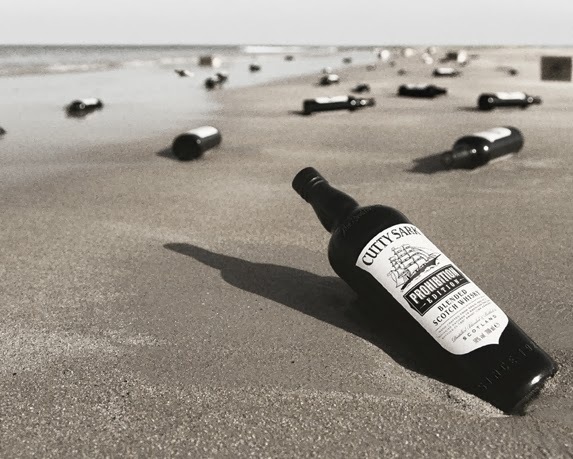 The Cutty Sark Prohibition Edition is one of the few whiskies that set the taste buds salivating, because it offers a rich spicy onslaught of malty goodness that is distinct and unique. Big, complex and boasting attitude, this whisky offers a thuggish nature that is sometimes craved in a whisky. This whisky is big and brutish in many ways, with a smacking character that may unsettle some whisky tasters; be warned. Malt Mileage Whisky & Spirit Reviews by Angelo Capuano is licensed under a Creative Commons Attribution-NoDerivs 3.0 Unported License. This website is all aboutcontinuous improvement, so spirits are re-tasted often. Prices listed are for the product from a major online Australian, American and British retailers. The prices are correct at the time of publishing.